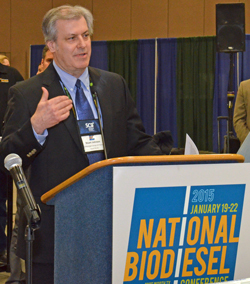 The Biodiesel Vehicle Showcase Event at the conference gave attendees a chance to get a sneak peek at what the automakers will be offering in terms of what will be available in the near future, especially in terms of biodiesel compatibility. News from Volkswagen’s Stuart Johnson was certainly music to the ears of those attending. Volkswagen is also big on using biodiesel in these vehicles and has worked hard with the National Biodiesel Board (NNB) and industry to make sure the fuel is up to specifications and will perform well in its diesel offerings. Stuart was glad to hear about the new BQ-9000 Retailer Program, which will ensure the quality of the biodiesel through the entire process, right into the consumers’ fuel tanks.